Just in on the HHL … HussHotLine. After his “I-will-meet-anytime-anyplace showdown” with Bob Mueller, “45’s” positions on meeting have been doing 360’s like Linda Blair’s head in “The Exorcist.” Sans projectile vomiting. Lawyers for “45” are apoplectic. They’re terrified he’ll impulsively slip out of the White House after scarfing down his two Big Mac, two Filet-o-Fish sandwich and chocolate malted dinner … for a clandestine slugfest with the one guy who can bring his kaleidoscopic reign to a screeching halt. The President’s lead lawyer, Ty Cobb, while sharpening his spikes and stealing second base, stated, “President Trump is fully prepared to go mano-a-mano with the #1 threat to the Free World … Attorney Robert Mueller. On the first day of their big meet, “45” shakes hands with Mueller and they seat themselves across the table in the Cabinet Room of the West Wing … each with a name plate … “45’s” bigger and lettered in gold. 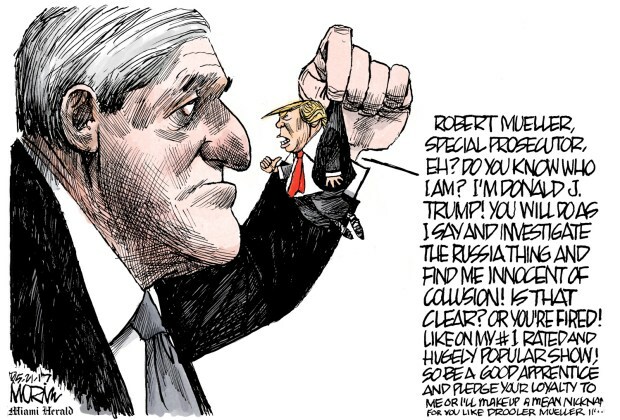 Before Mueller can finish, “45” jumps up kicking his chair from the table … his tiny trembling finger points at Mueller as he prepares to scream. Seated outside the Cabinet Room, Trump’s crack legal team look at each other with sneaky smiles and whisper … “I think we got just the right amount of zap to control ‘em. I object! Strenuously. Vehemently. Unequivocally. Bullwinkle is one word! As in Bullwinkle Moose and Rocket J. Squirrel: A possible LGBTQ couple. Outside of that, however, this is a “fair and balanced” report. Kudos!